Amerimax vinyl replacement windows are individually engineered to far exceed industry standards for energy efficiency, quality and value. Customer satisfaction is their number-one priority. Their success allows them to offer one of the industry's strongest, most comprehensive warranties and authorized dealer support systems. 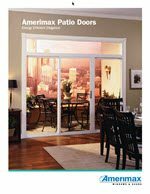 Transform your home with the versatile and elegant designs of the New Horizon Patio Door. Available in a variety of configurations including 2-panel, 3-panel and 4-panel, and optional overhead transoms, this series will complement any home while offering you unparalleled choices.